A non-coking coal is that coal which when heated in the absence of air leaves a coherent residue. This residue does not possess the physical and chemical properties of the coke and is not suitable for the manufacture of coke. Non coking coal like any other coal is an organic rock (as opposed to most other rocks in the earth’s crust, such as clays and sandstone, which are inorganic). It contains mostly carbon (C), but it also has hydrogen (H2), oxygen (O2), sulphur (S) and nitrogen (N2), as well as some inorganic constituents which are known as ash (minerals) and water (H2O). Coal was formed from prehistoric plants, in marshy environments, some tens or hundreds of millions of years ago. The presence of water restricted the supply of oxygen and allowed thermal and bacterial decomposition of plant material to take place, instead of the completion of the carbon cycle. Under these conditions of anaerobic decay, in the so-called biochemical stage of coal formation, a carbon-rich material called ‘peat’ was formed. In the subsequent geochemical stage, the different time-temperature histories led to the formations of coal of widely differing properties. These formations of coal are lignite (65 % to 72 % carbon), sub-bituminous coal (72 % to 76 % carbon), bituminous coal (76 % to 90 % carbon), and anthracite (90 % to 95 %) carbon. The degree of change undergone by a coal as it matures from peat to anthracite is known as coalification. Coalification has an important bearing on the physical and chemical properties of coal and is referred to as the ‘rank’ of the coal. Ranking is determined by the degree of transformation of the original plant material to carbon. The ranks of coals, from those with the least carbon to those with the highest carbon, are lignite, sub-bituminous, bituminous and anthracite. Low rank coals are typically softer, friable materials with a dull and earthy appearance. Higher rank coals are generally harder and stronger and often have a black and vitreous luster. The relative amount of moisture, volatile matter, and fixed carbon content varies from one to the other end of the coalification series. The moisture and volatile matter decrease with enhancement of rank while carbon content increases i.e., carbon content is lowest in peat and highest in anthracite. 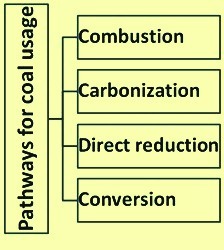 There are four major pathways (Fig 1) for coal utilization. The principal process by which coal is used is combustion which involves burning the coal in air to liberate thermal energy (heat). The heat is used as such for comfort or to carry out many industrial processes that require high temperatures. It is also used to generate steam for use in electric power plants. The second pathway is carbonization which is the heating of coal to high temperatures in the absence of air. It is used for the manufacturing of coke for the blast furnace process. The third pathway is the use of carbon of the coal for the reduction of ores besides using its heating value. In this pathway coal is used for direct reduction of iron ores. The fourth pathway is the conversion of coals. Conversion of coal is carried out by various chemical processes to transform coal into gaseous or liquid fuels, called synthetic fuels. Common to all these pathways is prior mining of the coal, its preparation (processing) and its transportation to the consumers. Brown coal – It is a non-agglomerating coal with a gross calorific value less than 5700 Kcal/Kg containing more than 31 % volatile matter on a dry mineral matter free basis. Brown coal usually is further subdivided into the following categories. Hard coals are of following two types. Coking coal – It is the hard coal which has special characteristics. It is suitable for carbonizing to produce coke which in turn is suitable to support burden in a blast furnace. Coking coal is also known as metallurgical coal. Non-coking coal – It is defined as all other types of hard coal which do not have coking properties. This coal is also known as thermal coal, steam coal, or boiler coal. Non coking coal has three uses in ironmaking. It is mainly used (i) for pulverized coal injection (PCI) into blast furnace, (ii) for the production of direct reduced iron (DRI) in coal based direct reduction processes, and (iii) for ironmaking by Corus, Finex and other iron smelting processes. Non coking coal required for these processes has more narrowly defined qualities than the non-coking coal used for power generation. To be useful in the metallurgical industry, non-coking coal needs to meet three criteria namely (i) its usefulness as reducing agent, (ii) low in sulphur and ash, and (iii) high heat value. To be a useful reducing agent, the coal must have very high carbon content. To keep the iron reasonably pure, the coal must have low contents of sulphur and ash. To provide ample heat, the coal must have a high content of fixed carbon and have a high heat value. The three approaches to characterize non-coking coals are given below. The chemical approach to characterizing coals is to determine the amount of the principal chemical elements in them which is carried out by the ultimate analysis of coal. Carbon and hydrogen are the principal combustible elements in coal. On a weight basis, carbon is the predominant one. Other elements are nitrogen and oxygen. Oxygen content in the non-coking coal is inversely related to carbon content. This is significant since the coal if it contains more oxygen then it is easier to start its burning, or to achieve its ignition. Sulphur content of coals is seen to be quite variable. Sulphur in coal has special importance because it contaminates iron and has issues related to the environment. The second approach to characterize non coking coal is to determine the thermal energy released when the coal is burned. This is determined by the heating value. The third approach is to measure other characteristics of coal which help to predict how coal behaves when handled and burned. This series of tests is called the proximate analysis of coal. Four characteristics are measured by the proximate analysis namely (i) moisture, (ii) volatile matter, (iii) fixed carbon, and (iv) ash. Moisture is an undesirable constituent of non-coking coal since it reduces the heating value and its weight adds to the transportation cost of the coal. When a coal sample which has been dried to remove its moisture is heated in the absence of air (without its burning) a further weight loss is observed. The material driven out is called volatile matter. Normally, coal with higher volatile matter content has lower heating values. The material remaining behind after the volatile matter has been driven out is the fixed carbon. The coal which contains a high proportion of fixed carbon is difficult to ignite but it burns steadily for a long time with a short, clean flame. Ash is the non-combustible residue formed from the inorganic or mineral components of the coal. The presence of minerals in coal is undesirable for various reasons. Of the four components determined by proximate analysis, only the volatile matter and the fixed carbon actually burn and liberate thermal energy. Sulphur in coal is of special interest because of environmental issues as well as it contaminates the iron. It occurs in coal in three ways. Organic sulphur is chemically bonded to the carbon atoms in the coal. Pyritic sulphur occurs in coal as grains of the mineral pyrite (FeS2). Sulfate sulphur occurs usually as iron or calcium sulfates. It is a very minor constituent of most coals. PCI coal is generally not considered to be a coking coal; rather it is used primarily for its heat value and is injected into a blast furnace to replace expensive coke. Low rank high volatile and high rank low volatile coal or blends of both are normally used for PCI. Since the coal is pulverized to 70 % to 80 % minus 200 mesh size before it can be injected into the blast furnace, coal for PCI must handle well and its grindability must match the equipment design in order to achieve the rated capacity for the installation. As in the case of coke, lower ash and sulphur content of the PCI is more desirable as they affect the coke rate and the hot metal production in the same manner, as the BF coke do. The relative importance of different aspects of PCI coal quality has varied, as the technology for injection has improved and the rate of injection increased. In the late 1970’s, interest in PCI was renewed and coal was considered as an economic replacement fuel for oil. As combustibility was considered to be of importance, the coals used for PCI were thermal coals. At that time, thermal coals were readily available and had a much lower cost than hard coking and semi-soft coking coals. As understanding of the impact of coal quality on BF performance increased the demand for lower volatile coals has increased over the last 5 years. Today, there are many criteria used to measure the performance of coal injection, both economic and technical, such as the following. Economic advantage – The main cost advantage is the replacement of high cost coking coal, though other benefits such as improved productivity have also been observed. The replacement ratio is kilograms of coke replaced per kilogram of coal injected and is reported as the ‘actual’ or the ‘corrected’ replacement ratio. The corrected replacement ratio is calculated after taking into the account the other changes in the energy and mass balance of the blast furnace which influence coke rate. Grinding and handling – The main operating costs, other than coal cost, are related to the grinding and the distribution of the coal to the blast furnace. The Hardgrove grindability index (HGI) is a good indicator for the expected grinding behaviour of the coal. The high HGI of a soft coal allows a grinding unit to be operated at a higher throughput with the same or lower power requirement. The size distribution of the coal can have impact on the combustibility of the coal as well as on its flow in the bins and transfer lines. Blast furnace operation – The injected coal quality can influence the quality of the hot metal, stability of the blast furnace and top gas composition. The ash from the injected coal can act as an inhibitor for the oxidizing process and is the main source of undesirable alkalis and consumes heat energy for melting as well furnace volume. Non-coking coal used in rotary kiln has dual role. It supplies heat for the process and also acts as a reducing agent. The major quality requirements of the non-coking coal are (i) non-coking characteristics, (ii) low ash content, (iii) low sulphur content, (iv) good reactivity, (v) high ash fusion temperature, and (vi) medium volatile matter. Non-coking character of the coal is necessary since the coking reaction leads to the formation of rings inside the kiln. Practically permissible caking index limit for the rotary kiln process is 3 maximum. Low ash content of the coal is necessary since the high ash leads to under-utilization of the kiln volume available for reduction. It also increases the consumption of fixed carbon since additional energy is consumed in heating the inert ash mass to reaction temperature. An ash content of 20 % maximum is the practical limit for efficient operation. Low sulphur content is required to control the sulphur in the DRI. The sulphur in the coal is to be 0.01 % maximum. Good reactivity of the coal is needed since an important step in solid state reduction process is the forward reaction, whereby carbon dioxide generated from burning of coal reacts with coal to regenerate carbon monoxide (Boudouard reaction). Hence, the coal is to possess sufficient reactivity so that the Boudouard reaction proceeds at the desired rate. Bituminous and sub-bituminous coals show usually good reactivity suitable for production of DRI. Ash fusion temperature is another important characteristic. Coals having low ash fusion temperature leads to sticky mass resulting into unstable kiln operation due to the formation of the accretions inside the kiln which reduces the reduction rate by formation of slag layer on surface of the ore. Hence coals with ash fusion temperature higher than 1400 deg C are desirable for rotary kiln operation. Volatile matter of the coal is to be optimum for coal based rotary kiln process. Coal with very low volatile matter result in very low reactivity of char, and thus give rise to poor metallized product. Very high volatile coals, though yield highly reactive char, are also not preferred since it increases gas volume in the kiln. Normally for rotary kiln process volatile matter is to be in the range of 25 % to 30 %. Coals for direct reduction in the rotary kiln need to have low swelling index. Normally swelling index is to be less than 1. The physical and chemical specifications of the non-coking coal are as follows. Non-coking coal, which can be used in Corex/Finex process, is to meet certain physical, chemical and high temperature properties for stable process and to attain high performance levels. The coal used in the Corex/Finex processes is required to supply heat for the devolatilization of the coal, the gasification of the char, and the melting of the reduced iron from the reduction shaft. It is also to provide sufficient gas to the reduction shaft to reduce the iron ore feed. Coals most suited for use with the Corex process have air dried fixed carbon content from 55 % to 65 %. This is to ensure good gas flow within the melter gasifier and to reduce the carry-over of coal and/or char. The amount of fine coal (minus 5 mm material) that is fed to the Corex process is required to be minimized. Hence, the coal is required to be sized or agglomerated before use. The alternative ironmaking technologies (smelting processes) are generally able to utilize a wider range of non-coking coals than those suitable for conventional coking. Optimum performance, though, is only being achieved with coals with a limited range of properties, as indicated in the Tab 1 for the smelting reduction processes. There is likely to be a premium for coals with lower ash and sulphur contents. In general, less coal and oxygen is required when coals with lower moisture, volatile matter and ash contents, and higher fixed carbon are used. Therefore ironmaking costs are reduced. Nonetheless, higher volatile coals may be preferred in smelting reduction processes which include a pre-reduction unit. These coals will also increase the steam credit and therefore the power generated from the export gas.